We're going to stick our necks out here and say: this is one of the most extraordinary (and extraordinarily effective) facial scrubs that we have ever tried. It's from Dermasuri, who specialise in skin-buffing. You can read our review of their 'flannel' exfoliator, here – it literally rolls the dead skin off the body in quite a totally 'ewwwww' way, but is unbelievably effective. In the case of Dermasuri Rice Milk Exfoliator, we're talking about a serum-format exfoliator which you rub into skin – and watch those dead surface cells roll off. 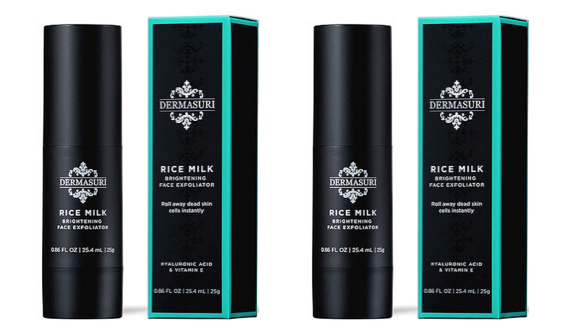 The more you rub, the bigger the 'dead skin rolls' become – although there's no need to use high pressure, because this rice milk-based formula does the scruffing work for you. At the end, you rinse – and we like to touch our faces before applying moisturiser, just to check there are no surface stray particles that should be swished away. The result is clearer, more radiant, vibrant skin – in about two minutes flat. Notwithstanding the fact it's incredibly addictive, we're sure this should be used this more than a couple of times a week – but it will be keeping our faces bright and buffed-to-perfection, from here on in.